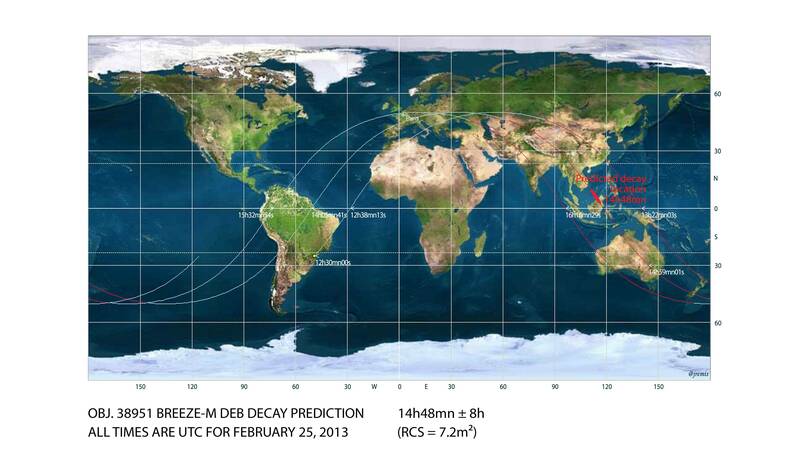 On February 25, projections forecast decay of a piece of catalogued debris from the Breeze-M upper stage that malfunctioned during an August 6, 2012 launch and subsequently exploded in orbit on October 16, 2012. The debris was anticipated to touch down over Indonesia. No sightings have been reported and it is possible the debris completely burned up in the atmosphere. There’s plenty more where that came from, with thousands of pieces of debris from the same explosion still orbiting. The next debris decays to watch, though, are pieces of Iridium 33 and Cosmos 2251 originating from a 2009 on-orbit collision, and Fengyun 1c, stemming from a 2007 Chinese anti-satellite test. Those two events themselves produced enough debris to keep trackers occupied for many years to come.